Beirut (Agenzia Fides) – One of the major objectives of all the incidents that unfolded over the past years is to make the Middle Eastern societies of Levant racist, unilateral, conflicting and belligerent, that pave the way for a new Levant, stranger to its unifying identity, and very far from the religious, social and cultural diversity that characterizes it. 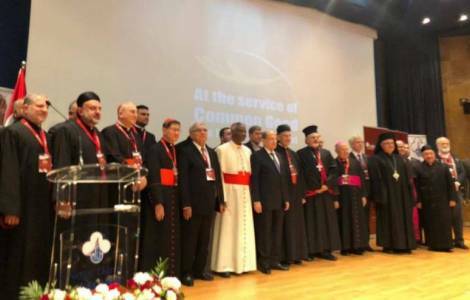 The alarm was launched on Wednesday, 27 February, by Lebanese President Michel Aoun, speaking at the regional conference of Caritas in the Middle East and North Africa, which is currently taking place at the Saydet el-Jabal Congress Center in Beirut. In his speech, the Lebanese President described the Middle East as a mixture of cultures, an intersection of civilizations and the cradle of the divine religions. It is a unique example of spiritual, cultural and cognitive richness, and striking any of its components means undermining it and its uniqueness. "The land of the Levant", said among other things Aoun "must not be emptied of its people; the cradle of the Christ, the Road to Calvary and the Holy Sepulcher cannot be without Christians, just as Al-Quds (Jerusalem) and Al-Aqsa Mosque cannot be without Muslims". The Head of State emphasized: "the real importance of Caritas lies in its cross-confessional, cross-racial, cross-national and cross-affiliation activity, regardless of the religion, identity and race". Also Cardinal Luis Antonio Tagle, President of Caritas Internationalis and Cardinal Peter Kodwo Appiah Turkson, Prefect of the Vatican Dicastery for the promotion of Integral human Development attended the summit. (GV) (Agenzia Fides, 28/2/2019). AMERICA/UNITED STATES - Bishops establish an Ad Hoc Committee "against the sin of racism"